Stardate 1314.5. As Americans flock into cinemas to see the new Star Wars movie, No Crowds headed for the Royal Borough of Kensington and Chelsea in London to check out the Linley Sambourne House. It’s not exactly the Star Ship Enterprise, but a visit to the perfectly preserved Victorian house at 18 Stafford Terrace is also a voyage of discovery, this time of the 1890s, that is equally loveable. It’s life in London, Jim, but not as we know it. To visit the family home of the celebrated cartoonist Linley Sambourne, who lived at 18 Stafford Terrace from 1875 to 1919, you need to book a guided tour. Two options exist depending on the day and time. Either you go around the house with a “regular” guide or, on Saturday and Sunday afternoons, you can be a guest of the Sambournes and be taken round the house by a member of the family household. In our case, the guide was the housekeeper, Mrs Reffle, who met us at the door in Victorian dress and all in a tizzy as we were not expected, - even though, as the 21st century website recommended, we booked our tour in advance. But being a gossipy and cheery soul who clearly enjoyed spilling the beans on the family more than seeing to the housework, Mrs Reffle showed us straight in to dining room and proceeded to regale us with the cost of the house (£2,000) and the wall paper (£70) as compared to her annual salary (£25), plus what went on the other evening at Oscar Wilde’s house and the amount of claret and champagne consumed at the previous night's dinner party. With a raised eye brow, Mrs Reffle pointed out the table upon which Mr Sambourne, who had a penchant for taking ‘artistic’ photographs of naked women, posed his models and the more sedate desk where Mrs Sambourne kept the family accounts. And so it went as we travelled through the five story house. 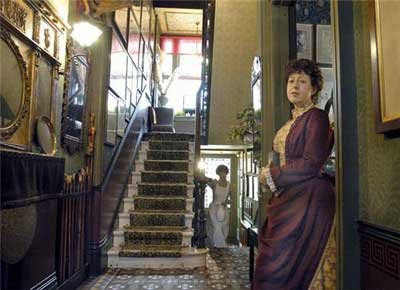 Thanks to the fact that the Sambourne’s were concerned with presenting a fashionable and artistic home and that virtually nothing has been altered in the place since the 1890s, we spent a perfect hour time travelling through the Victorian universe under the guidance and steady hand of Captain Reffle. The children on our “trip” had a splendid time as did the adults. London has more than its fair share of excellent time-travelling tourist attractions; Dennis Severs House, the Old Operating Theatre and the Ben Franklin House come immediately to mind, but as good as they are, I have never seen a group of tourists turn themselves over to an experience with quite the same enthusiasm as at Linley Sambourne House. This is tourism with a twist and the combination of the perfectly preserved house and tour guiding theatrics is an absolute winner. Go Saturday and Sunday afternoon and give Mrs Reffle out best.